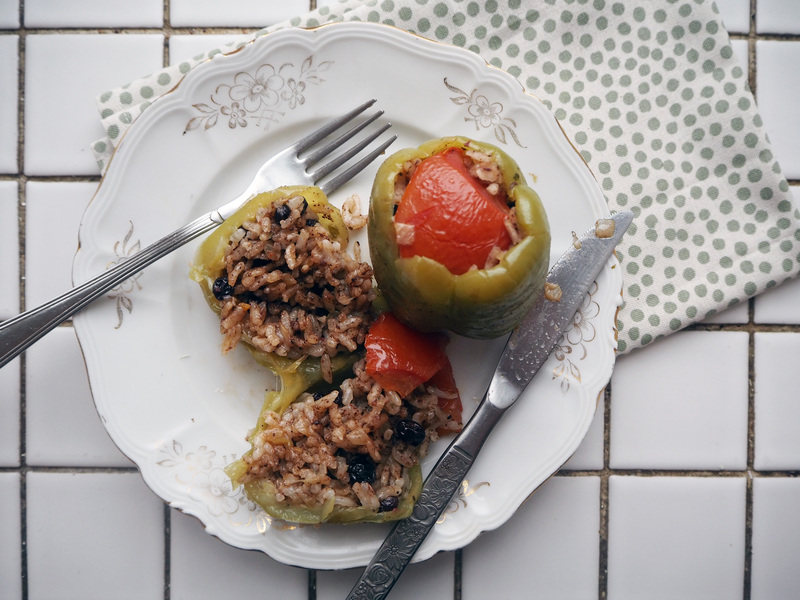 Green Peppers Stuffed With Aromatic Tomato Rice – Hello 2019! I admit. I haven’t felt inspired to write for a while. I’ve been baking & cooking as usual, so it’s not about food. But I just felt like doing other things, like reading – I purchased many books lately about food justice, feminism and seed sovereignty. So I’ve been reading them. And I also went to a 2-weeks holiday in Istanbul during new year so yes, excuses excuses, but this blog post was long overdue.. 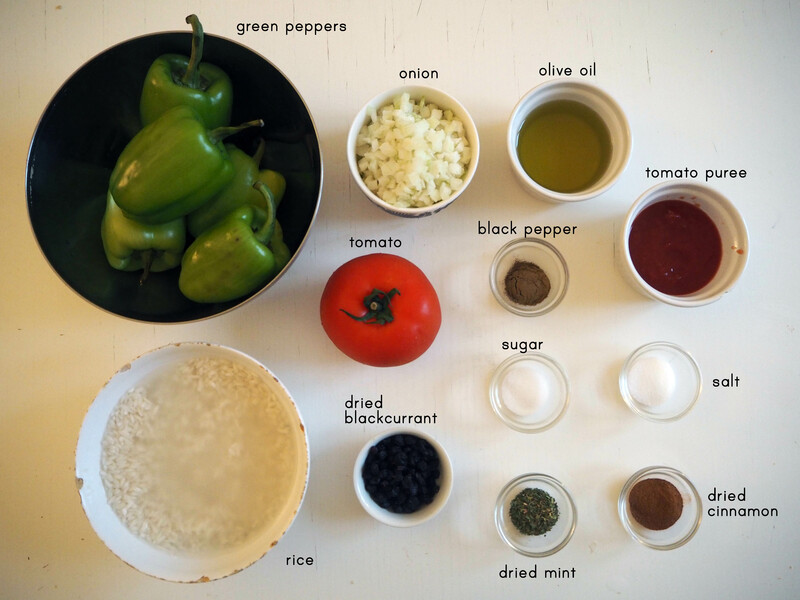 So, what is this recipe? This is one of my favourite dishes. I love it eating at any time of the day. Yes, I even ate it for breakfast many times. It is very rich in taste and it is not heavy at all. 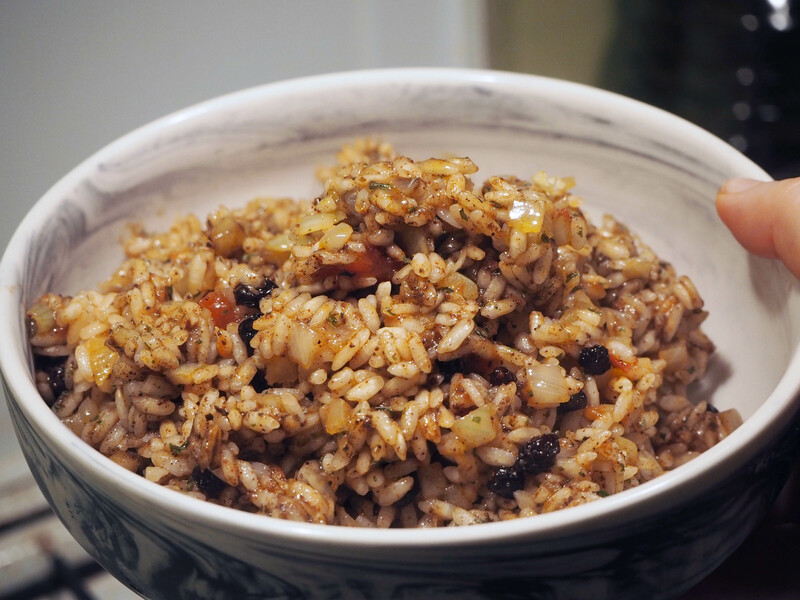 There are many stuffing recipes in different cuisines. Some of them include meat, some are vegetarian. Among all of them, this is by far my favourite stuffing recipe. 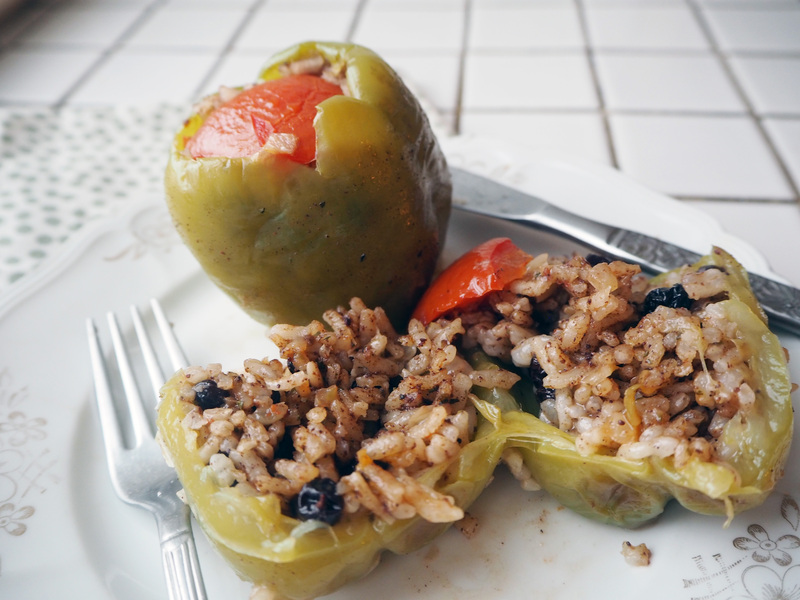 The Turkish name for this dish is “dolma” and the peppers used for it are particularly called “dolmalik biber”, meaning “pepper for stuffing”. These are basically sweet bell peppers, smaller than the ones sold in regular Finnish markets, with a thinner and slightly softer skin. They are found in Turkish market(s) in Itäkeskus (not all the time though, and it is generally quite hard to find all good and fresh peppers in one package). 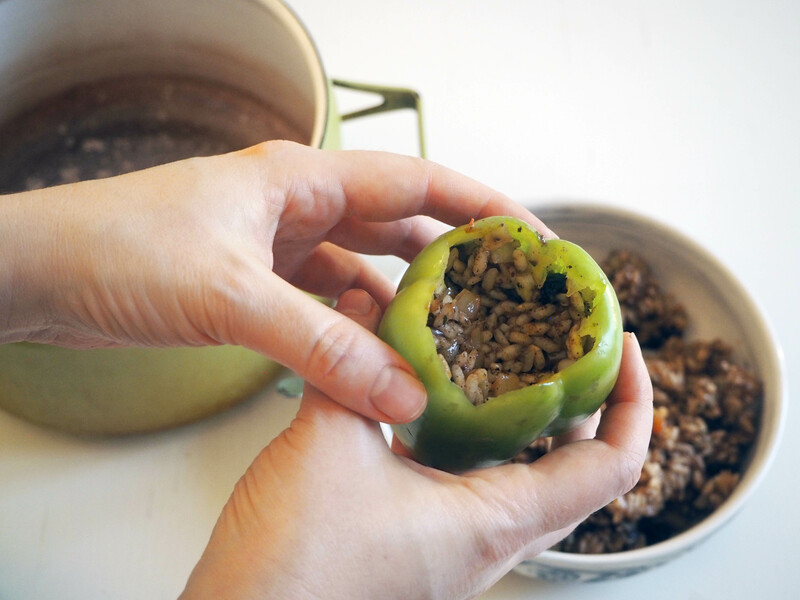 However, if you cannot find this kind of peppers, you can still cook this dish with normal bell peppers – you just need a bigger amount of stuffing since those peppers are much bigger and you need to cook them a bit longer as they are also thicker. I like eating this dish cold. What I mean by cold is not “right out of the fridge, with shivering teeth”. So when I want to eat or serve it, I let it come close to room temperature and then eat. I do not reheat it and frankly I do not ever recommend you to reheat it either. 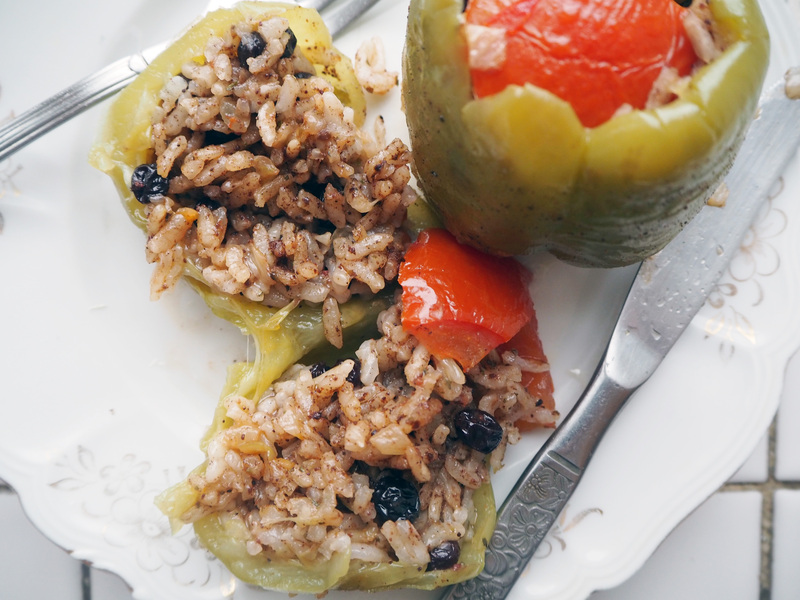 I hope you can find some of these peppers and try this recipe and if not, I hope you give it a try anyway with normal, bigger bell peppers. Enjoy your new recipe and happy new year! 1. 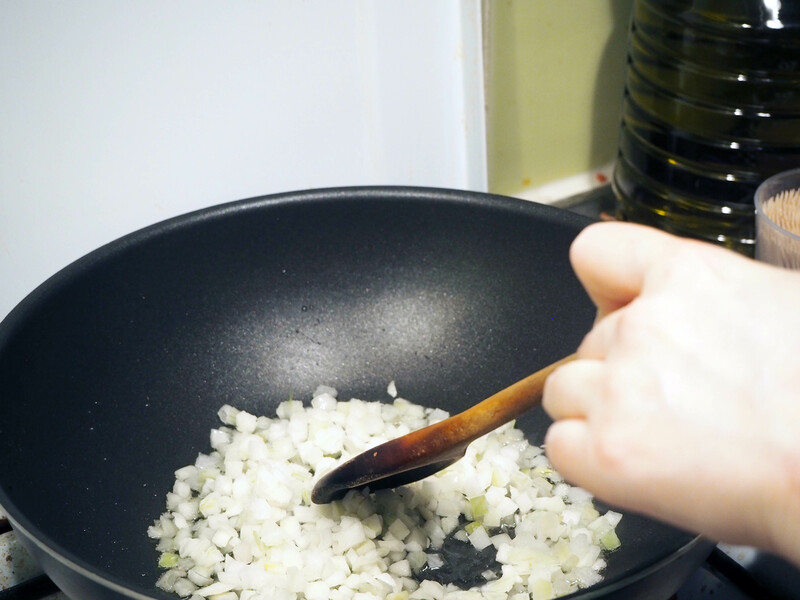 In a big pan, put olive oil on medium high heat. 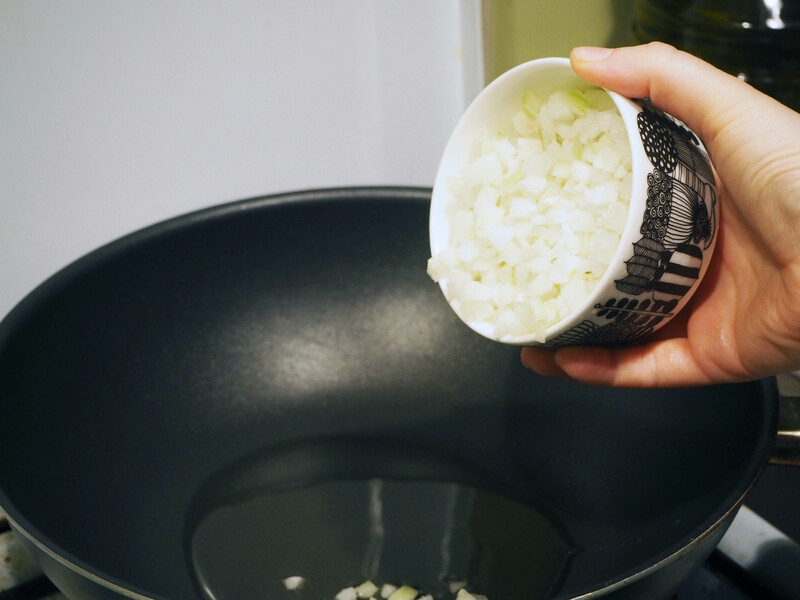 Add onions and saute for 2-3 minutes, until they get translucent. 2. 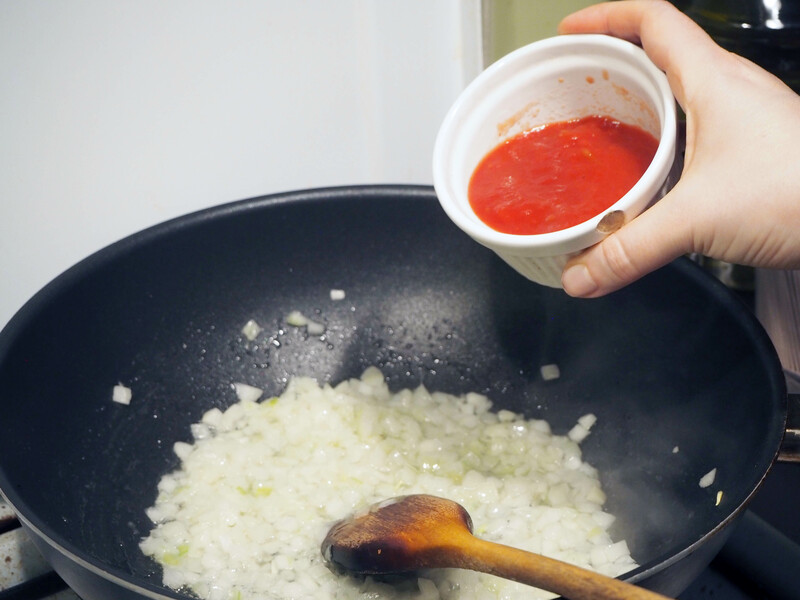 Add tomato puree and continue to cook for 2 more minutes while continuously stirring. 3. 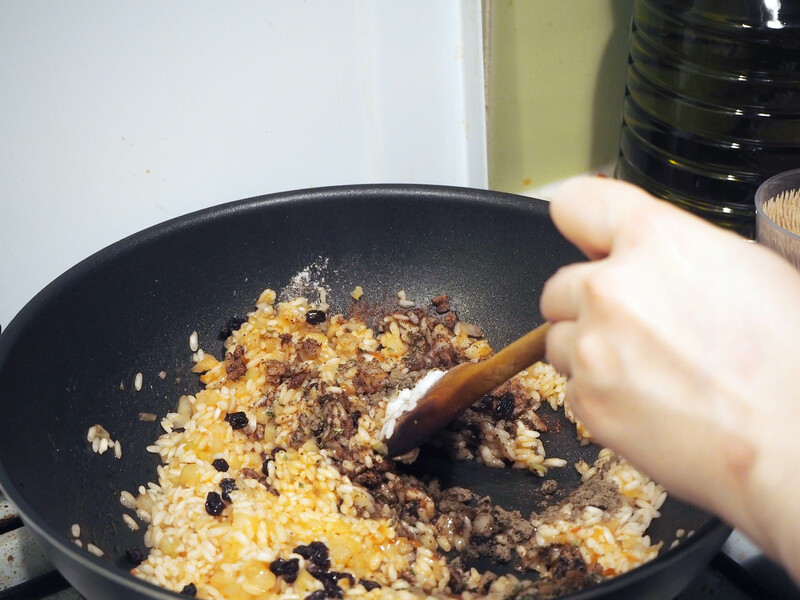 Add rice and fry it with the rest of ingredients for about 2 minutes while stirring. 4. 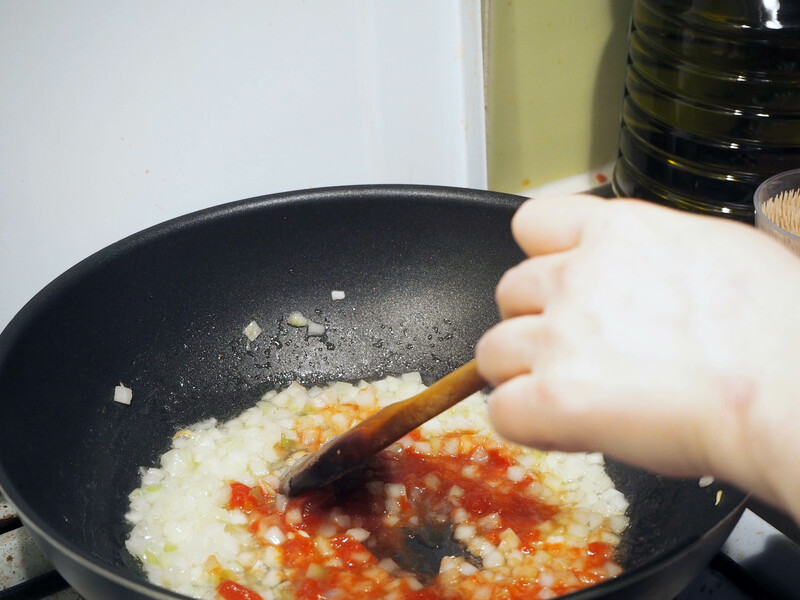 Add the rest of the ingredients for stuffing, give it a good stir and take away from the heat. 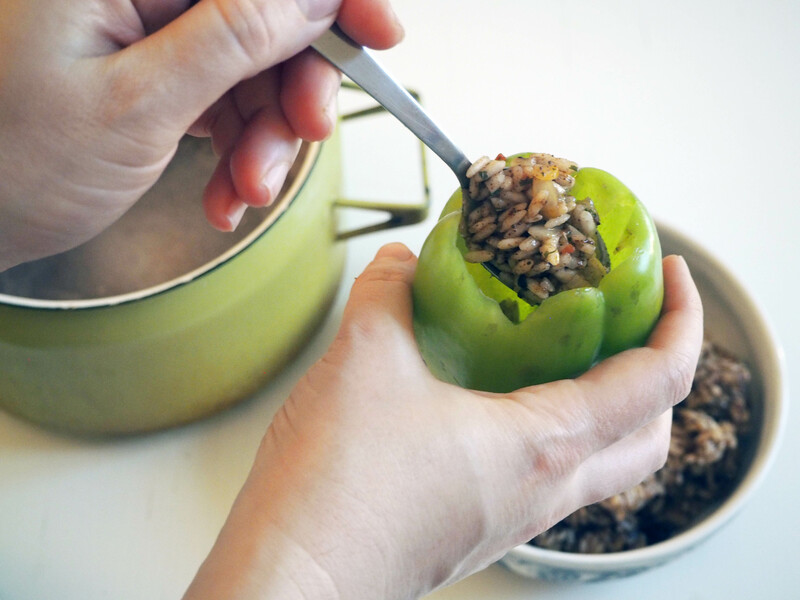 Transfer to a bowl and let it cool while preparing the peppers. 5. 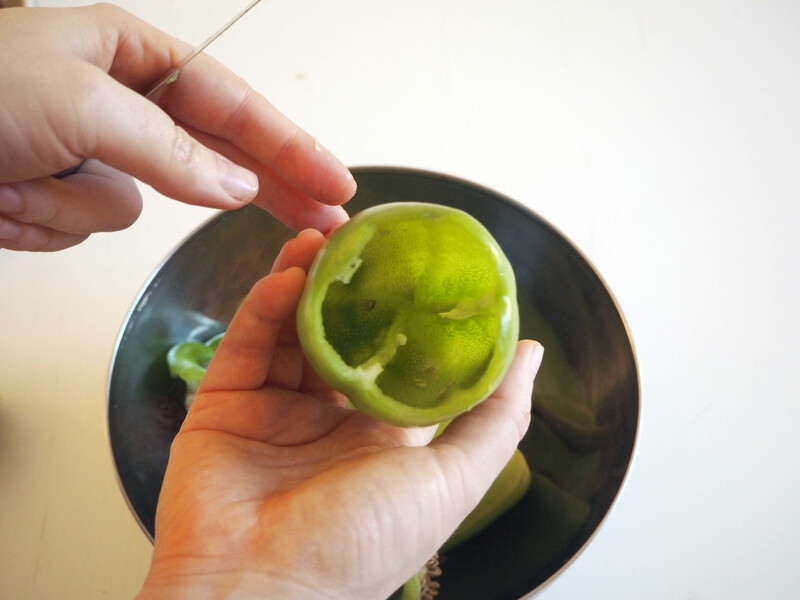 Cut the head of each pepper as shown in the photos and empty each pepper from any seeds inside. You can use the heads as cover as I wrote above in ingredients list, or you can discard them. 6. 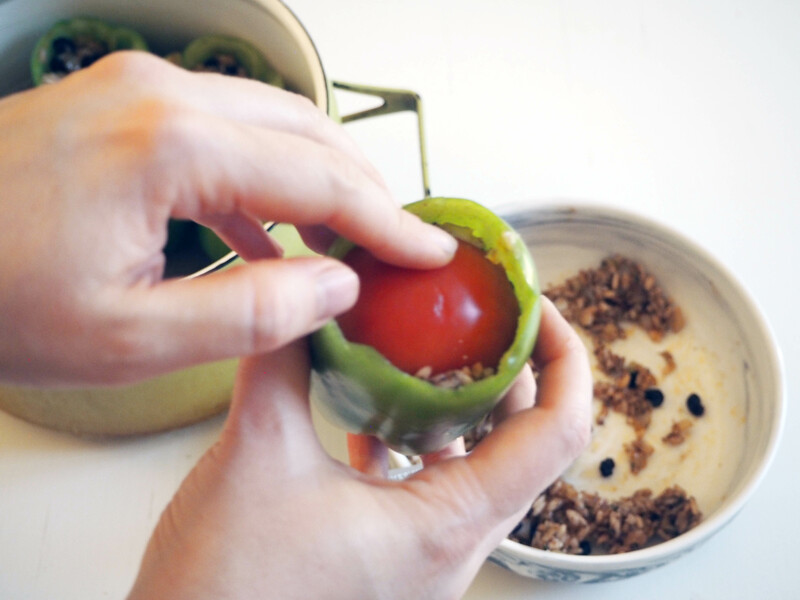 Spoon stuffing ingredients into each pepper. Do not fill them fully. 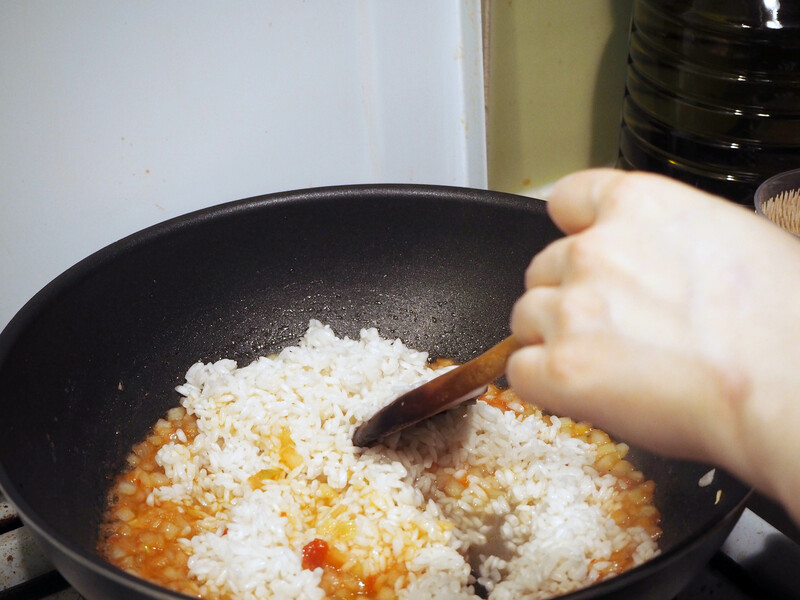 As the rice cooks, it will get larger so leave some space from top thinking about this. 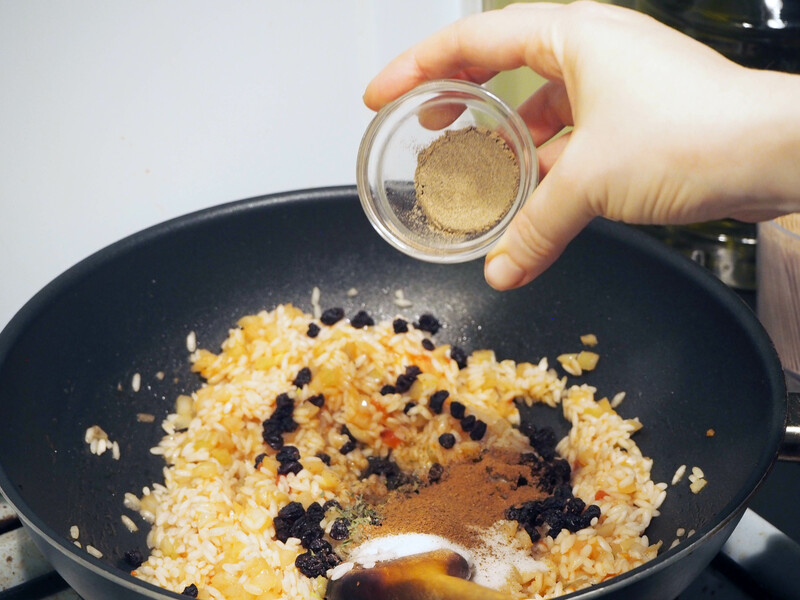 If you fill the peppers fully, the rice will get larger and spill out of the peppers. 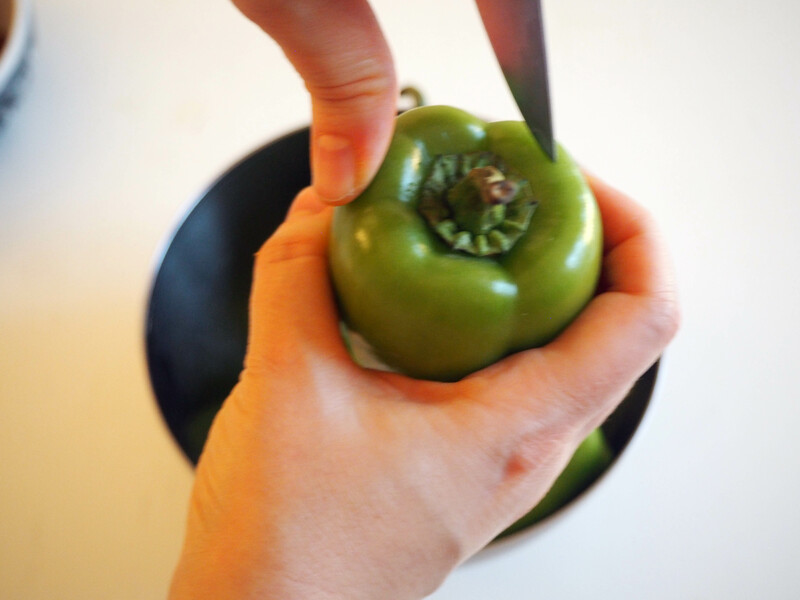 Cover the peppers with pieces of tomatoes, or with their own heads. 7. 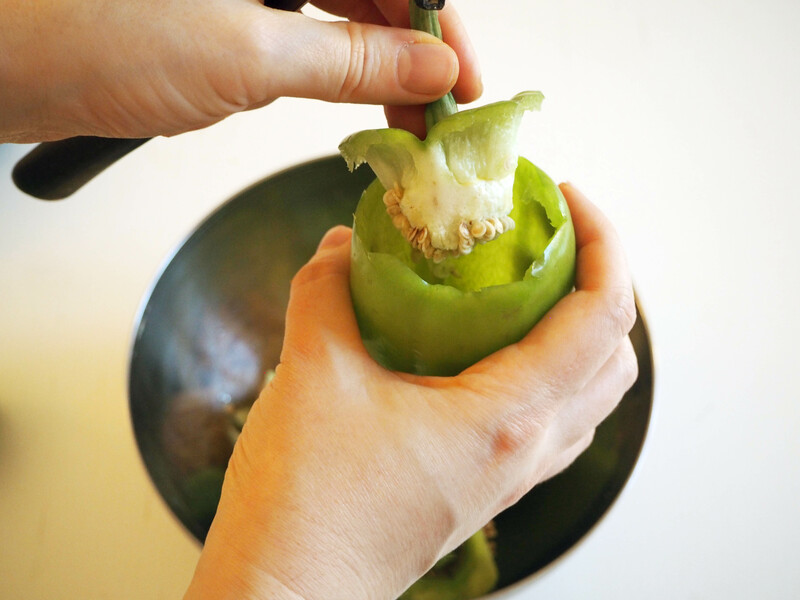 Put the stuffed peppers in a heavy bottom pot, with heads looking up. 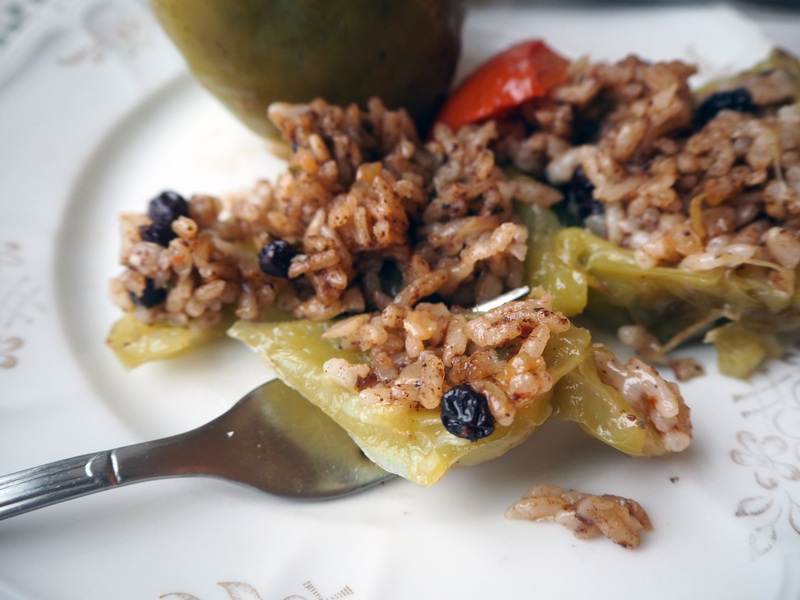 Pour olive oil on the peppers – I am not saying any exact amount, just make sure that each pepper get some oil on it. Fill the pot with warm water up to about half of the peppers and put the pot on medium high heat, with cover half open. 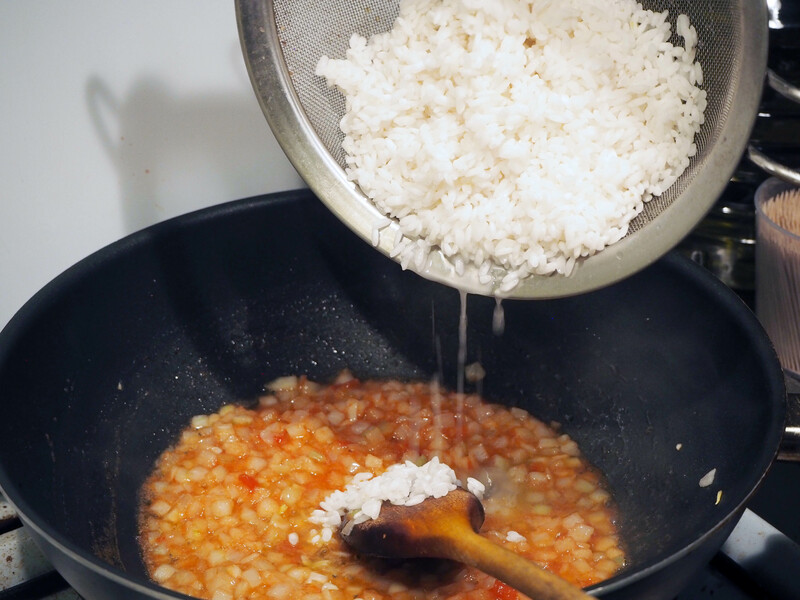 When the water starts boiling, lower the heat to medium low and cook slowly until the rice cooks and peppers soften and cook. 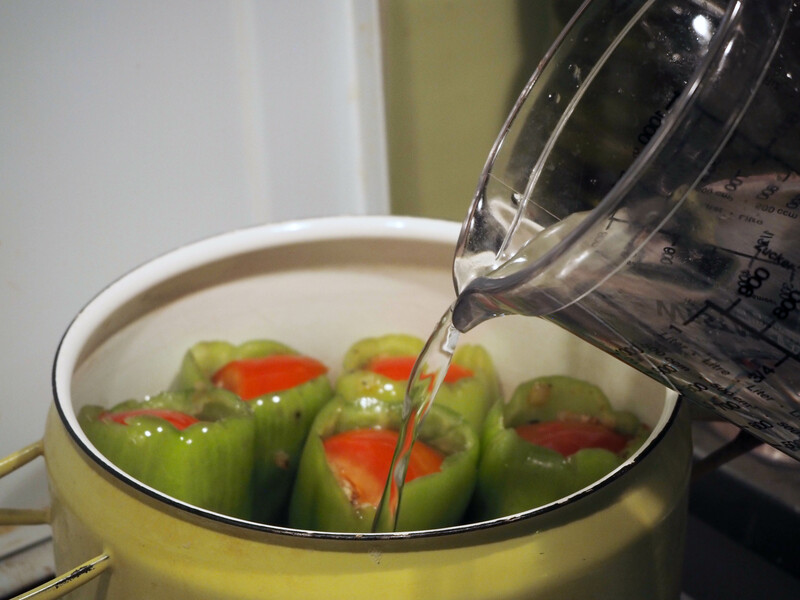 Check the amount of water regularly, so that the pot does not run out of water and the bottoms of peppers do not burn. 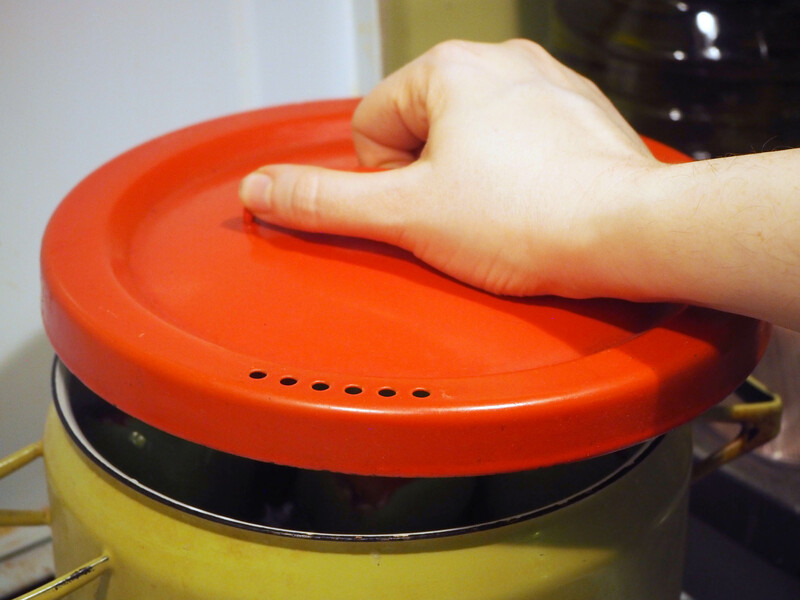 If you need to add water while cooking, make sure that it is hot water (not necessarily boiling water, but very hot). 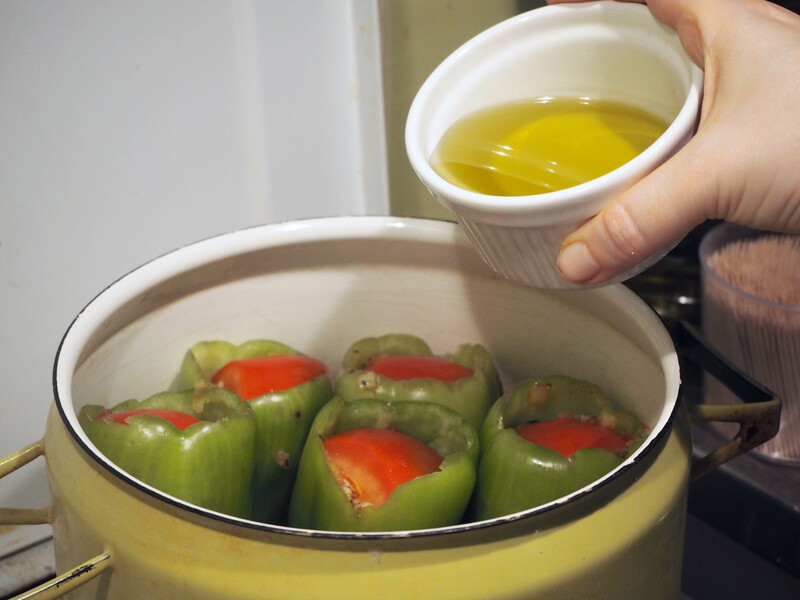 When the peppers cook, take them out of the heat and out of the pot into a serving dish and let them cool down. I like to put them in the fridge for a couple of hours at least after they come down to room temperature. The tastes develop better this way. I also like cooking it a day before I serve, because next day it tastes even better. But you can also eat it fresh and a little warm even, it’s up to your taste at this point. Enjoy your peppers! The currants likely give the stuffing just the right amount of sweetness. Thanks for sharing–and Happy 2019! Yes exactly! Hope you try! Cheers! Next PostOrange And Ladyfinger Dessert – So Refreshing!